For limited time only, save 50% on the Canon MF249dw dropping from $299.00 to $149.00 when you buy this item at Adorama .com and Shipping is free! From the ManufacturerOverviewThe all in one, Canon imageCLASS MF249dw offers feature-rich capabilities in a high quality, reliable printer that is ideal for any small office environment. The MF249dw has print, scan, copy and fax capabilities so you can accomplish all necessary tasks with just one machine. With so many easy to use features, such as the intuitive, easy to read, tiltable, touch LCD panel and various mobile solutions, your daily workflow will be a breeze.Professional Laser OutputYour professional quality documents are printed at speeds of up to 28 pages per minute1 in black and white with a quick first print time of 6 seconds or less2. With ID Card Copy, you can easily create copies of identification cards or other small documents on a single page. The Canon imageCLASS MF249dw also supports host-based UFR II LT and PCL 5e/6 languages to provide printing versatility. You can also send scanned documents and forward received faxes through email or file server.Wireless and MobileThe Canon imageCLASS MF249dw has wireless connectivity, increasing your productivity and allowing you to print from almost anywhere in your home or office3. The device also has built in Wi-Fi Direct capability4, enabling easy connection to mobile devices without a router. The MF249dw is equipped with a variety of easy to use mobile capabilities for printing on-the-go using your compatible mobile device, such as Apple AirPrint5, Mopria? Print Service6 and Google Cloud Print?7. 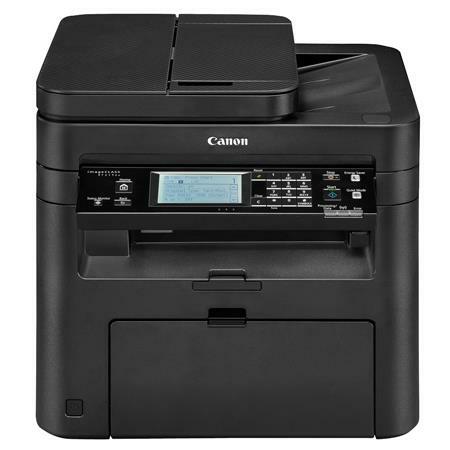 The Canon PRINT Business8 app allows users to print to and scan from the device to compatible iOS or Android devices.Paper HandlingThe Canon imageCLASS MF249dw offers generous paper handling so you can enjoy limited paper replacement interruptions. With the front-loading 250-sheet paper cassette, 50-sheet duplex automatic document feeder and 1-sheet multipurpose tray, your paper handling needs covered9.Eco-Conscious FeaturesThe Canon imageCLASS MF249dw is part of Canon U.S.A?s Generation Green Program, which highlights the company?s commitment to sustainability. The device is eco-conscious, using approximately 2 watts of energy in wireless, Energy Saver mode, helping you save money on energy costs. Automatic duplexing right out of the box helps you save on paper and related costs.GENUINE Canon TonerThe Genuine Canon Toner is designed to help improve image processing and precise character printing as well as overall image quality. The Single Cartridge System combines the toner and drum into the same unit which means you only have one consumable to replace. Canon GENUINE supplies are designed by Canon engineers and manufactured in Canon facilities. They are developed utilizing precise specifications, so you can be confident that your Canon device will produce high-quality results, time and time again. This machine uses Canon GENUINE Toner, Cartridge 137 Black (full yield cartridge yields 2,400 sheets, ISO/IEC standard).Disclaimers:1 Print speed is based on internal testing. Print speed may vary depending on the number of copies selected, as well as on the settings for size, type and orientation of paper. 2 May vary depending on the output environment. 3 Wireless printing requires a working network with wireless 802.11b/g or 802.11n capability. Wireless performance may vary based on terrain and distance between the printer and wireless network clients.4 Wi-Fi is a registered trademark of the Wi-Fi Alliance. The Wi-Fi CERTIFIED? Logo is a certification mark of the Wi-Fi Alliance.5 AirPrint functionality requires an iPad, iPad Mini, iPad 2, the new iPad, iPhone 3GS or later, or iPod touch 3rd generation or later device running iOS 4.2 or later, and an AirPrint-enabled printer connected to the same network as your iOS device. A printer connected to the USB port of your Mac, PC, AirPort Base Station, or Time Capsule is not supported. 6 Mopria Print Service, available for free at the Google Play Store, requires a compatible Android KitKat 4.4 smartphone or tablet. The printer must be either wirelessly connected to the network router or with an Ethernet cable. The mobile device and printer must be connected to the same network.7 Google Cloud Print requires an Internet connection and Google Account. Printer firmware update may be necessary for Google Cloud Print? function. Certain exceptions may apply. A PC running Windows XP or later or a Mac running OS 10.4.11 or later and USB cable are required to perform firmware update.8 Canon PRINT Business is a free app available on the App Store and Google Play? Store. For more information, including compatibility, please visit https://www.usa.canon.com/mobile-app. Users of Canon Mobile Printing can simply update the app to use Canon PRINT Business. Users who have installed Canon Mobile Scanning for Business should install Canon PRINT Business on their compatible device. After Canon PRINT Business is installed, users can re-register their Canon Mobile Scanning for Business device list and local documents. Android is a trademark of Google Inc. App Store is a service mark of Apple Inc. iPhone, iPad Air, iPad, iPad mini, are trademarks of Apple Inc., registered in the U.S. and other countries. iOS is a trademark or registered trademark of Cisco in the United States and other countries and is used under license.9 Based on 20 lb. bond paper.